@SPLASHNEWSUSA: If you are looking for a well-balanced, sefira album without music, (years ago that would not have made sense!) this is it! Ari Goldwag has been making music for a while now with his own music and acapella albums, Sheves Achim, and Sheves Chaverim, you also may have heard a recent hit song of his- called Yesh Tikvah. Yeh, he composed that. 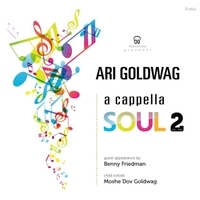 This album “Soul 2” is the second in his acapella series. Hence, the big number 2 on the album. I’m a genius for figuring that out! The album features 11 tracks of which 3 are brand new songs! There is an assortment of slow and fast songs. Ari told SPLASHNEWS that this album is a little different than the last one. Ari decided to use fast songs also because the period of sefira is a mixture of sadness and hope. Although there is no music or beats on this album, the very talented Ari, used his voice to create a truly full sounding album with beautiful harmonies and bass to round it out. I joked that the bass, which I love, sounds like it was sung by a frog. 1. Borchu- The album starts off with this upbeat brand new song. The first low is sung by Moshe Dov Goldwag before we get our first listen to the sweet voice of Ari in the high. I think it’s a great song all around from the low to the high and the intro. It does have a little bit of a YBC flavor to it. I love the bass which is sung by Kermit the Frog. Just kidding! 2. Aishes Chayil- This is a heartwarming slow song that he dedicates to…his wife. Shocker! It was originally recorded on the album “Simcha B’Libi”. I really enjoyed the choir throughout the song as well as Ari’s background vocals. The song transposes at 4:47 before the last high and simple ending. 3. Am Echad- Yeh this is the famous Am Echad from Ari’s latest album which was released a little before sukkos this past year. If you have not watched the creative music video for this yet, be sure to check it out. I thought this would not sound good without music but I was wrong. Same catchy song but a drop smoother and less intense which makes for a pleasant listen. 4. Hinei Ma Tov- Here is brand new slow song. Intro by Ari and Kermit the Frog. This is a really different style song and really grew on me. You might have to give this one a second listen. Like a good wine, it gets better with age. 5. Shallow Waters- You may remember this song from one of Goldwag’s older albums. Besides for the catchy tune, this track also has great lyrics. It’s about how we should stay away from the “shallow waters in the world today” and try to live with sincerity. I always liked this song and was really excited that Ari brought this one back. 7. Nodeh- This sefardi-style song was also featured on the Am Echad album. This fast song with an even faster moving high part, features a lot of the young vocals of Moshe Dov. I have to be honest that for my taste, this song sound a tad empty without music. Maybe I’ll listen to this on one of my “sad” days. I like the way he did the bridge in acapella starting at 2:38; cool stuff! 8. Zeh Hazman- This is a brand new, more upbeat, song that I love! The lyrics both in Hebrew and English, give over a message of how this time of Sefira is a time of tikkun and a time to work on the mitzvah of “Veohavya l’reacha kamocha”. Great song with a fun catchy tune! This might be my favorite fast song on the album. 8. Ribono- This is a moving and georgeous song that was originally recorded on Shea Rubensteins’s album, “Ohavti”. I was crazy into this song when Shea first put it out and at the time, I told people how this song would be awesome in acapella. Thanks Ari! You will not be disappointed with this song. Be sure to check out Shea Rubenstein’s version as well! 9. I’m Imperfect- This song has a great message even though it is not so much my style. Also as I type now, I just got an email from Ari letting me know that he has a brand new music video for this song that will be released by the time this goes to print. Can’t wait to see it!